Throughout this tip, we’ll be using the Shell in Cosmos DB and outputting fewer fields than our documents store so that we can see consolidate views. In addition, some of the queries won’t have corresponding images, but will have the document count that we expect along with the query to execute. We’ve seen that we can remove or update records by using the unique key. We can also remove or update a group of records by using groups or by using operators. In the below query, we return all of the documents in our Azure Cosmos DB that are Treadmill Runs, displaying only the distance and time to show a consolidation of these documents. What if we wanted to remove all records that were over 3 miles? We could remove all the Treadmill Run types and add the two values that are exactly 3 back – but this would not be efficient if we had more documents. We have four Treadmill Run documents – what if we want the two above a distance of 3? Here we’ll look at using operators. For this case, we’ll use a not equals operator ($ne) because our values for distance are strings. In Azure Cosmos DB, we should the appropriate string operators like we would use with SQL Server, .NET or other programming languages and because our distance values are strings (as opposed to numbers), so we’ll use the not equals. We’ll see that we follow a similar structure to our query so far where we specify the field and then open brackets with our operators. This is the SQL Server equivalent of WHERE Distance <> “3”. Since our numerical values for these documents are strings, let’s apply a math operator to our numerical values. We see two documents return with distances above 3. In the below query, we use the math operator greater than ($gt) to return our Jump Rope/Pushup Circuit exercises in our Azure Cosmos DB where we did more than 250 pushups. We’ll notice that our query for this follows the same syntax: we specify our field (Pushups) and use our greater than operator with the number we want returned above the value. We see three documents with pushups greater than 250. With querying values in Azure Cosmos DB, we can use the below comparative operators that can be used similar to operators in SQL Server. The list covers the useful operators that we may require in common CRUD operations, especially in removals or updates. Without showing images of the results, let’s run the below queries in our Azure Cosmos DB and see what we get using each of these operators minus the ones we’ve already seen in the above examples with images. I highlight the number of results we should get each time. We use the equals operator ($eq) to find all the Treadmill Runs where the distance is equal to three miles and we get back 2 documents. We use the greater than or equals to operator ($gte) to find all the Jump Rope/Pushup Circuit exercises where there were 290 pushups or more and get back 2 documents. We use the in operators ($in) to find all the documents that are exercise types of Treadmill Runs or Endurance and we get back 6 documents. With Azure Cosmos DB, using the in or not in operators works like an array (for those familiar with object-oriented languages), where we’re looking for values in our array or not in our array. In the above query, we specify the values we’re seeking within the square brackets  and because these values are a string, we wrap these values in quotation marks. We’ll use this same operator again, but this time apply the operator to numbers and we’ll notice that we remove the quotation marks because in Cosmos DB, these are not required for numerical values. This numerical in query returns 2 documents. We use the less than operator ($lt) to find all Jump Rope/Pushup Circuit exercises where the pushups are less than 290 and we get back 2 documents. We use the less than or equals to operator ($lt) to find all Jump Rope/Pushup Circuit exercises where the pushups are less than or equal to 290 and we get back 3 documents. Similar to the in operator ($in) which uses an array in Azure Cosmos DB, we use the not in operator ($nin) to get all the Treadmill Runs where the distance is not in 3 or 3.1 miles. We get back 1 document. Identical to the in operator, we must pass in the appropriate type for our array – string values for strings and numerical values for numbers. For dates, we format our in or not in like strings, as we see in the below query which returns 7 documents. For our Cosmos DB, suppose that our client wanted to set Treadmill runs at 3 miles only, regardless of whether it exceeded that value. We could run an update statement, but for this example we will remove these documents in a set – removing two documents using our operator not equal ($ne). However, we want to keep these values in our database, so we’ll re-add them back with the same details except the distance is 3 miles instead of the more detailed values. Rather than add them as we’ve done in the previous tip, we’ll first store the documents in objects that we’ll add later. We can store documents in objects – in this case, we store two documents in separate objects doc1 and doc2. From here, we remove the documents in our Azure Cosmos DB that have distances not equal to 3 miles and validate the removals with a query to return the 2 documents remaining. We remove 2 documents and confirm we have 2 remaining. Now, we’ll insert our two documents that we stored in two different objects – doc1 and doc2. Notice that we simply have to pass in the object with the insert statement and the record is added. We add back our two records with the correct distances and validate we have four documents. We save a query result to an object. We save multiple documents in one object. This becomes useful in many contexts with Cosmos DB, as we can re-use the object we’ve created if we need the documents for multiple purposes. In addition, we may want to transform the data for reports or for feeding to other back-ends and these objects allow us to do further manipulation without affecting the underlying data in our database. Using operators can save us significant time when we remove documents or run updates on documents. Some updates may be applied relative to a field filter, but we may need to drill further into a field, like we saw with removing and re-adding our Treadmill runs. 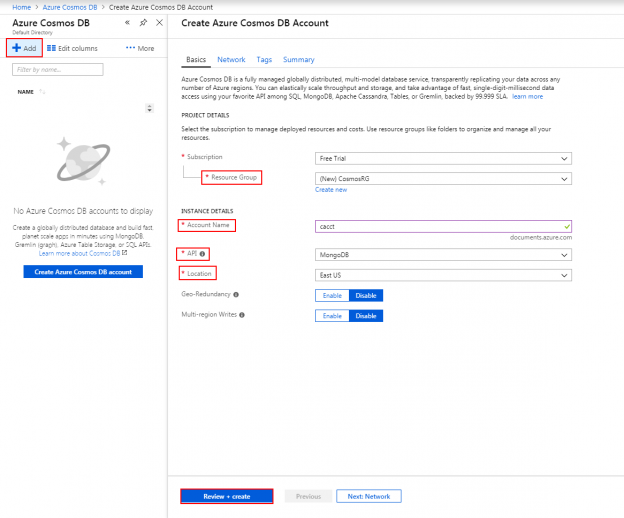 Azure Cosmos DB provides us with many standard operators we use with back-ends like SQL Server, which allow us to execute our CRUD operations against multiple documents at a time. In addition, we can create documents and save them to objects, or save query results in objects, from one document to multiple documents in the same object.